We all know that between 16-18 million Military Personal Files were destroyed in the fire of 1973 at the St. Louis National Personnel Records Center. This fire destroyed about 80% of Army records from Nov. 1 1912 to Jan. 1 1960; and 75% of all Air Force records from Sep. 25. 1947 to Jan 1. 1964. So how can you get military information on your ancestor? NARA National Personnel Records Center has always had access to Morning Reports to recreate records lost in the fire. 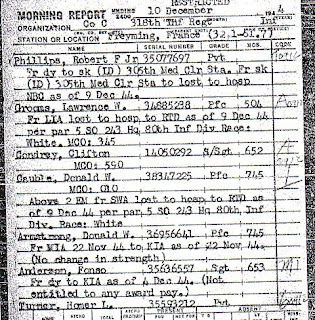 These Morning Reports for the Army and Air Corps units are for 1940-forward. Although reports are not based on an individual, they do give a daily account of the unit. Individuals are listed in the case of promotion or demotion, being killed, wounded or missing in action, or going to a hospital for treatment. Monthly, quarterly, and semi-annually Unit Rosters are also included. In order to access the correct Morning Report, the veteran’s exact unit of assignment must be known. Morning Reports and Unit Rosters are available on microfilm and not indexed by individuals. These reports, now available to researchers, gives additional ways to recreate your ancestor’s service. But prior to reviewing the Morning Report for details of that incident, the exact unit will be needed. One customer was looking for a veteran who was wounded while “taking a farm house” in Holland during the “Battle of the Bulge. The approximate date given was Oct 15, 1942, but the exact unit was not known. It is possible, however, that his discharge date and the battalion listed on his payroll will provide us with the first Morning Report to research. Additional reports may need to be researched to pinpoint the exact incident. Each related film must be read, and searches are often needed for several years. This must be taken into account when budgeting for research. a3Genealogy offers a daily rate for this research.